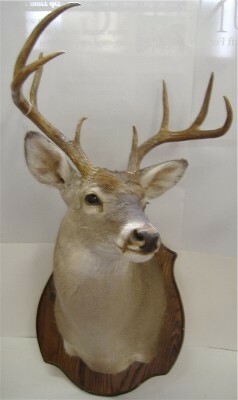 This beautiful Whitetail Trophy Buck Mount is from The Wildlife Ranch in Mason, Texas. Mounts of this high quality make a fine addition to any collection. Great for any hunting enthusiasts. The lengths of the antlers off this Whitetail Trophy Mount measure 22 (left) and 21 (right). The circumference of base is 4" (left) and 4" (right). The greatest inside main beam spread is 18 1/8". The greatest circumference between points one & two is 3 4/8"(left) and 3 3/8" (right). The greatest circumference between points two and three is 3 1/8" (left) and 3 1/8" (right). Length of first point is 3 1/8" (left) and 3" (right). Length of second point is 5 6/8" (left) and 6" (right). Length of third point is 9 6/8" (left) and 7" (right). The wood plack measures 21 1/2" high by 18" wide. The mount is in excellent condition and will be enjoyed for many years to come.